I'm ready for Santa ...! We're back to our regular schedule programming ...! A perfect day to get some quilting done. I have this quilt top that has been at the flimsy stage for quite some time. All it needs is for me to piece the backing and load it onto Penelope. 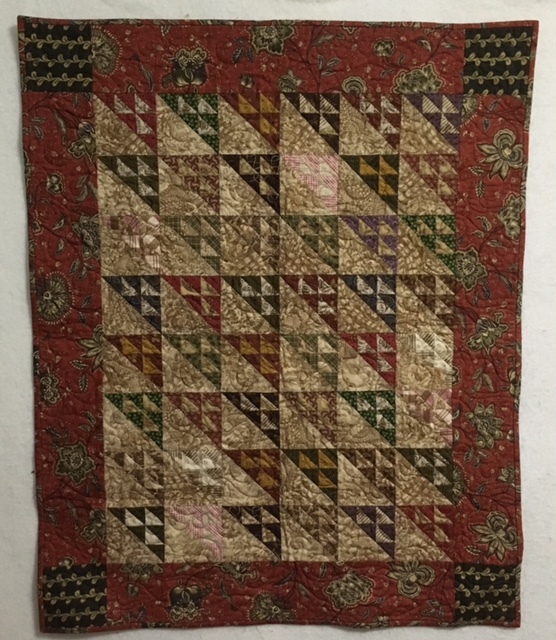 The quilt pattern is called Snipped by Cotton Way. But first, I need to clean up this mess! Why does my cutting table and sewing desks become a dumping ground?! Sigh! Fall Market 2016 .... last post! By Sunday I was beat! I usually stay until the end (Monday) but experience has taught me that Monday is useless. It was truly relaxing! I enjoyed my quiet time .... Starbucks and journalling. Here is another view. I really relished Fall market this year. I think it was because I attended without pressure to purchase anything. My goal was to see the trends for 2016 and take in as much inspiration as possible. What's trending? A super hero theme certainly was prevalent! 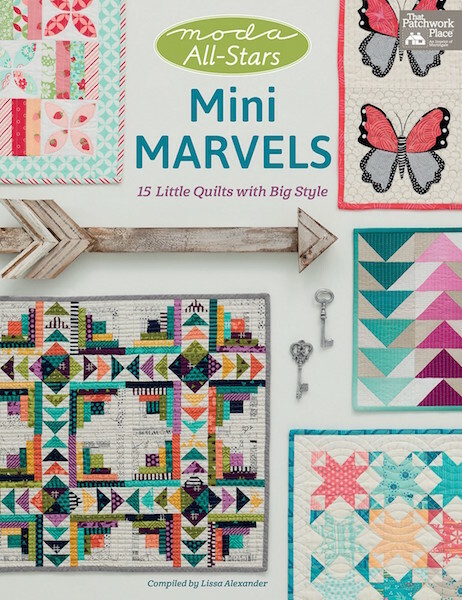 Check out this sweet quilt kit! Quilters are Superheros by Moda. Kits are available here. So true, I love that quilt! How cute is that? I just don't know if I want to cut up my cute towels to make the dolls! What I did buy was purely because I felt it would be a good addition to Fibre Junction. Perhaps this new attitude is due to experience. I don't know, I just know that it felt great to walk the aisles, observe, and take it all in. I did purchase some batiks. I love Island Batiks .... their colours are saturated ... Gorgeous! 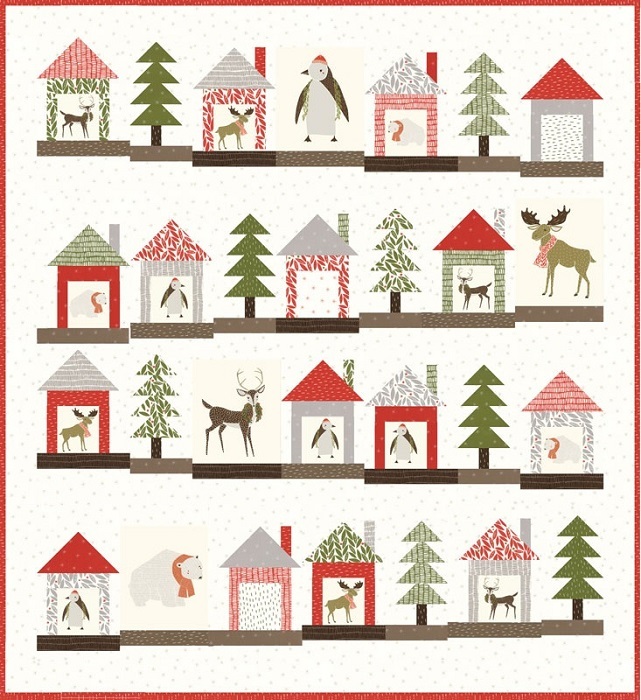 As for holiday fabric, I purchased the following kit Snow Goose by Minick & Simpson. Fabrics and kit arriving in April 2017. I did make the decision to bring in more happy fabrics, so Rainy Day by Me & My Sister is coming to Fibre! That's it for Fall Market 2016. Thank you for stopping by my little corner in cyber space! Cheers! Fall market 2016 .... Part deux! I apologize for being a bit behind on this post. Life just seams (ha! ha!) to get in the way! I enjoy walking the market floor. There is so much to look it. I will admit, it can get a bit overwhelming, there is so much to see! I enjoy looking at the ways the various booths are decorated, so original. I had to stop at the Riley Blake booth and see what they had. In December 2016, Fibre Junction will be receiving Lori Holt's (Bee in my Bonnet) new fabric line ... Sew Cherry 2. I just love that quilt made with the fabric line! 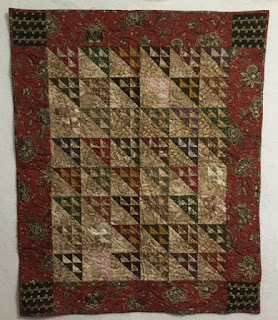 Such a happy quilt! They also had a cute wall of small quilts! I need a wall like that in my sewing studio! As a matter of fact, I need more happy in my life! I fell in love with Merrily by Gingiber for Moda Fabrics. Her panel is so crisp ... yes .... 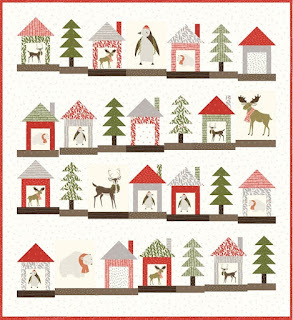 I just had to order Bambi and the necessary fabrics to create this gorgeous wall hanging. Isn't it cute? I just love it! She does have a quilt made with another smaller panel that is just as sweet! That's it for now .... thank you for stopping by my little corner in cyber space! On a positive note ....! Or stumbles along the road. Or stumbled beneath the same load. Though hidden away from view. May cause you to stumble and fall, too. May cause you to stagger and fall, too. Don't be too harsh with the man that sins. Or pelt him with words, or stone, or disdain. And it's only wisdom and love that your heart contains. To see through his eyes, instead of your own muse. That you've been blind and narrow minded, even unkind. Who have so little hope, and too much worry on their minds. Brother, there but for the grace of God go you and I. Before you cast a stone or falsely judge his conditions. And remember the lessons of humanity taught to you by your elders. In other people's lives, our kindnesses and generosity. Hey everyone, I'm back and had a marvelous time. I left extremely early on Thursday morning, so early that I was able to photograph - Sun Rise over New York City! First thing I did once I set foot in Houston was officiate the beginning of market by enjoy my first margarita ... Cheers! The Moda theme for market was "quilters are super heroes in disguise" and what an appropriate theme it was, for me anyway. 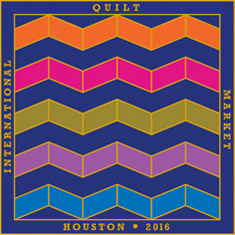 It was at this market that I finally had the opportunity to meet my Quilting Hero, Lynette Jensen of Thimbleberries. I have always wanted to meet her. She was/is so such a part of my quilting experience. Last night I counted the number of Thimbleberries books I own and the total is ... 14 books. Although I have cleaned out my quilting library numerous times, I could not part with her books. 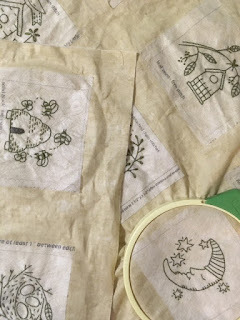 For me, her books are a connection to my quilting past ... besides ... I still like her style! Lynette is back designing her traditional Thimbleberries fabrics with RJR. She also has a new book coming out in January 2017 - Thimbleberries with an Attitude. I love the title! 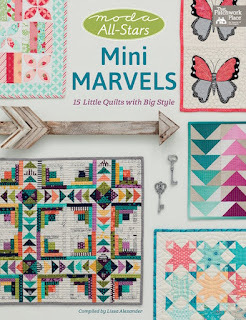 In her new book she takes her traditional quilt patterns and gives it a modern spin by using fabrics designed by Cotton + Steel. Another schoolhouse I enjoyed tremendously was hosted by Martingale and Moda All-Stars Mini Marvels. The theme was Super Heroes! What fun it was to see the Moda designers dressed as Super Hero Quilters. I actually won the book as a prize! I just couldn't believe it! I so rarely win! You can just imagine how excited I was. That's it for now! Stay tune for part 2! Thanks for stopping by! Catch you later! Cheers! It can happen to anyone .... ! I pressed so hard on the fabric that the rotary cutter flew off the edge of my ruler and hit my index finger ... OUCH! ... It's a deep cut, but not deep enough for stitches! I lost a pint of blood!!!! Ok, I'm exaggerating but ..... Change that dull rotary blade!!! Seriously, I was lucky this time .... it could have been worse! It's called My Little Year ..... I have just a few more blocked to stitches and it's onward to the piecing of the quilt! Thanks for stopping by! Don't forget to change that dull rotary blade!!!! We have a partial finish .....! I had way to much fun stitching out My Little Home quilt. So much so, that we have a finish! Check this out! 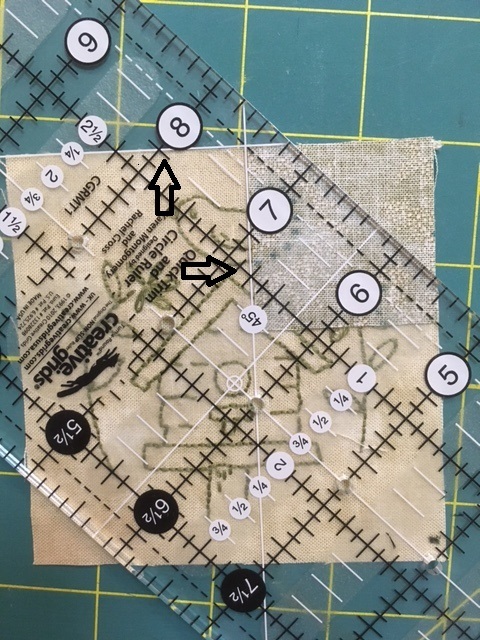 The black dashed line is your quarter inch seam allowance. Using the white 45 degree lines (aligned with the top of the block and the side of the square) as well as the dashed black line (making sure that it lines up with the corners of your square), you are now ready to cut the excess. Take the block to your sewing machine. 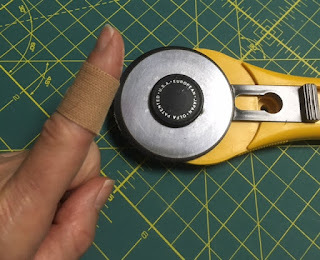 You are now using your Patchwork foot (1/4" foot) as a seam guide. All stitched up from corner to corner. Iron and voila! How easy is that? Repeat for the remaining three (3) corners and your have your block. You are now ready to piece your quilt together. In case you are curious about the green fabric, Kim Diehl - Heritage Hollow. 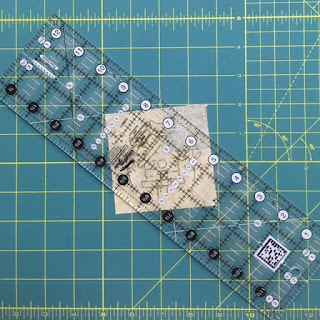 I just love the Quick Trim Ruler for these types of block. 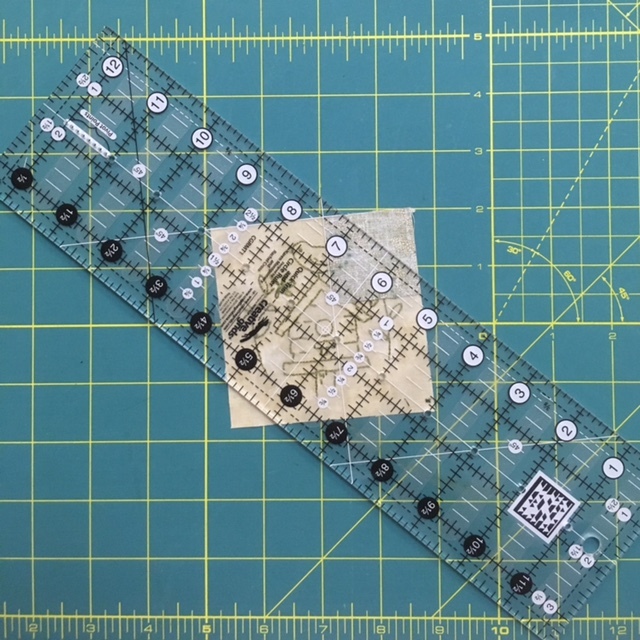 The ruler works with any block requiring a 45 degree sewing line from corner to corner. 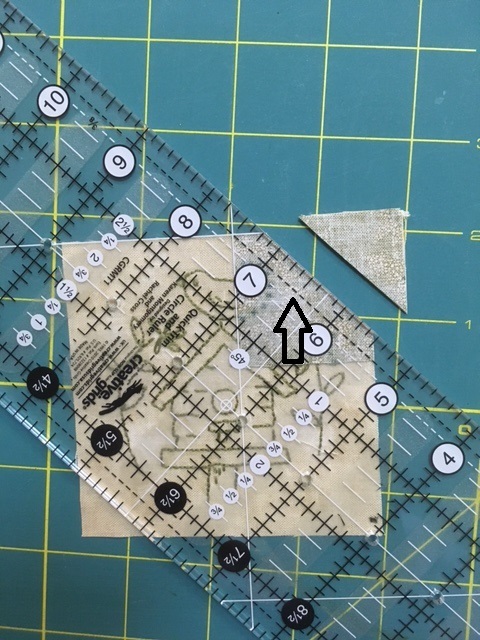 It's much easier to use your patchwork foot as a guide. Of course there other methods for making these types of block, but this one is my favourite. Guess what I'll be doing tonight? 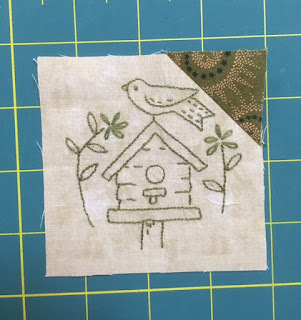 Machine quilting this little gem! Thanks for stopping by! Cheers! The World of Social Media ....! Do any of you Tweet? Well, I do ... on occasions. You can find me at the following handles: @fibrejunction and @ceridwen59. When you own a business, there is a lot of pressure to be a part of the social media community ... they (the business gurus) keep reminding you of how important it is to have a presence ... everywhere! So naturally, I tweet my blog posts. Would you believe I actually had a "like" from someone? Truth be known, I do not lead an exciting enough life to get "likes" but ... it's okay by me. However, I am proud of this "like" ... Rare indeed! It's an Alien! Thanks for stopping by my little corner in cyberspace .... No Borgs please! UFOs, Aliens .... oh my! I continue to power walk/jog at least 5 days a week. The weather has been so nice! That is quite an accomplishment for me given that I have never been one to get "excited" about any form of exercise. Last night, on my power/jog walk, I came across my first ever crop circle. Yes sir, a crop circle in small town America! 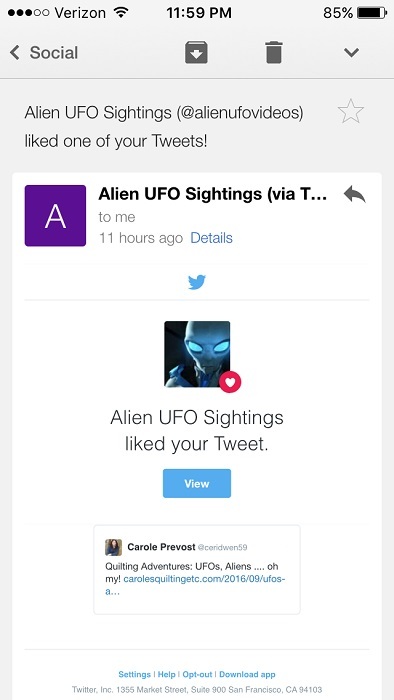 Well, I'm sure you've had enough excitement from a small town in America ... onward to UFOs! 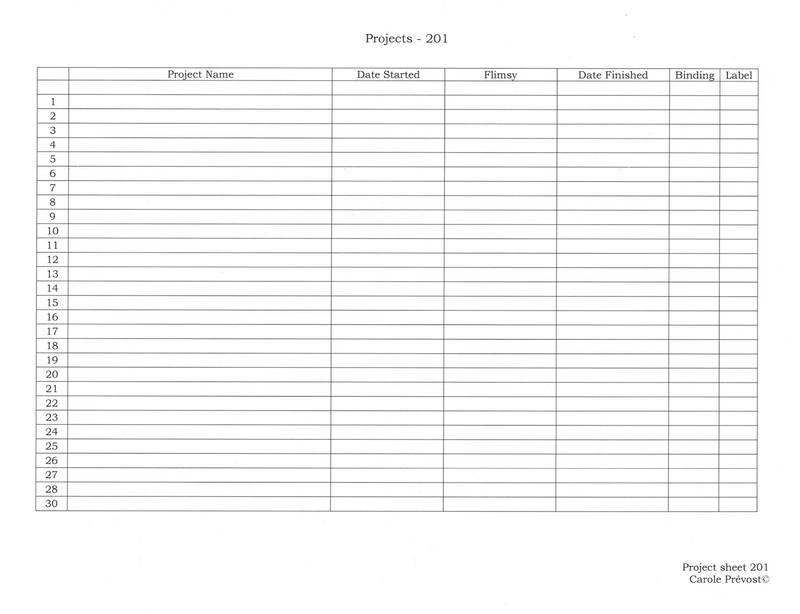 I'm still focusing on those UFO lists ... one problem, I just cannot seem to decide which project to tackle next. 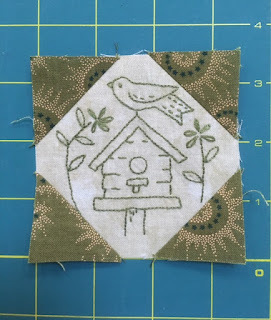 I'm presently working on My Little Home, a pattern by Kathy Schmitz. These little hand embroidery blocks are getting stitched in no time. 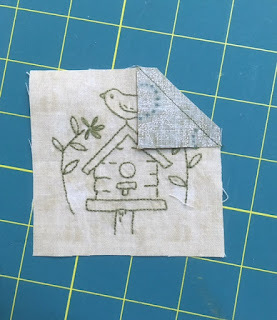 It's an adorable little quilt and I cannot wait to show you the finished quilt top. I have just a couple more blocked to stitch! Thank you so much for stopping by my little corner in cyberspace. Catch you later! Cheers! Label it .... you own it...! I hope you have all had a wonderful Labour Day Weekend. Myself, I ended up going in to Fibre Junction and working on the website, imputing Lecien Cosmo floss. What a job! Today, owning a small business requires lots of skills that I am positive our foremothers did not have to acquire. Anyway, by 3:30 p.m. I was crossed eyed and had to call it a day! Yea, I popped opened a bottle of wine and had a glass! Cheers! I'm still on this "finish UFO" mode and completed Vintage Holiday - a Jo Morton quilt. Not only did I finish the quilt but ..... I actually took Ancient Bernie out! Focus Carole ... focus .... just focus ... back to completing UFOs! It's a done deal ....! The mystery quilt has been delivered! For the curious ones, the recipient was my mum! I think she was a tad happy to receive it. Her eyes teared up ... it's a good sign! I love my mum to pieces! I managed to capture this photo of the both of us. I love how it turned out! Then, get rid of the ones you are no longer passionate about ... 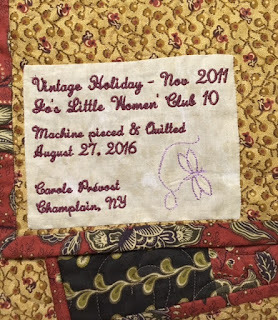 I write down where the quilt project went. This way I have a record of what happened to that project. Used Hobbs 100% wool batting. I will admit, I'm loving wool! It's light .... and oh so comfy! I now use wool batting for all my winter quilts (and for some I give away) and cotton for the others. What is your choice of batting? Forever is not for us mere mortals ....! As I mentioned in a prior post, lots of changes are taking place in my life. I've been working on a new me ... it's a work in progress! As part of this new me, I've been taking better care of myself, which includes ... physical exercise. Yesterday afternoon was humid and hot (we did have a bit of rain). Focusing on my goal, I managed to find the motivation to go for my power walk/jog. OMG, it was brutal! There were some sort of flies/large gnats all over the place. I had never seen a swarm of pesky dipteran like those in my area! They were all over the place, making it difficult to dodge them. I definitely jogged with my mouth closed! Not sure they were the edible kind! But .... I did it! Hoory for me! Hopefully, tonight these pesky little flies will no longer be around. On another note, not wanting to sound morbid, but lately, I have become more aware of my mortality. I'm not getting any younger and have this need to clean out or finish off quilting projects. 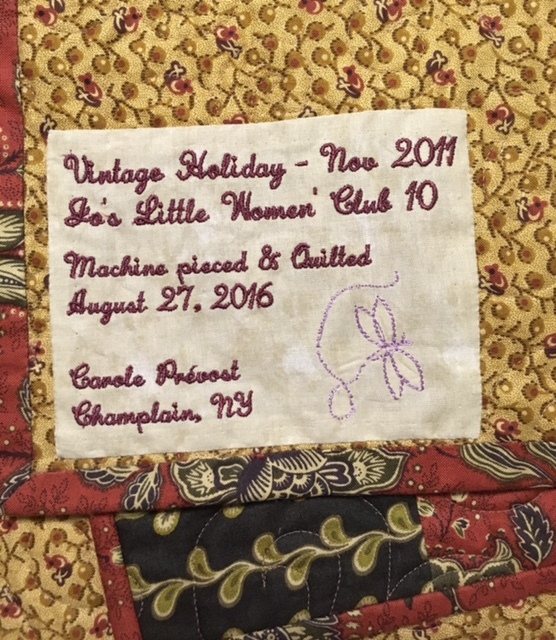 I remember a story that a past guild president shared with us regarding her deceased mother's quilting projects. She had inherited the task of finishing her mother's UFOs. This task weighed heavily on her. Sadly, no one knew if her mother's UFOs were quilts she was passionate about or just something she couldn't bare to throw out! Here she was, pressured to spent valuable time finishing quilt projects that were her mothers. This is not something I would want my little Pumpkin or my friends to undertake. 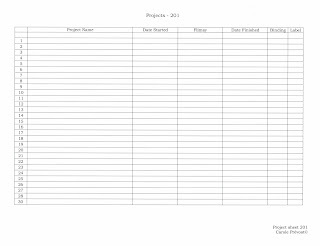 Last Saturday, I took an inventory of all my UFOs (I do keep a yearly Word document of my quilting projects started) and decided that I needed to either complete the projects on the list or get rid of them. I wouldn't want to leave a mess for someone else to clean. So, I'm cleaning and working on the quilts I want to finish and getting rid of the ones I no longer want ... And, some quilts will just have to become smaller projects! 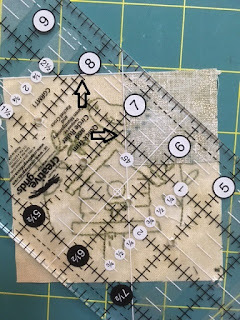 I will admit, it is difficult to get rid of a project when the blocks are all done, it's just a matter of sewing them together and putting the border on! Here is my first project. Well, I best be getting busy! Enjoy your day everyone! Cheers! Allowing my wisdom to shine ...! There are a lot of changes taking place in my life. It is true what they say, as you get older what was important in your youth seems to take a back seat. All of a sudden, your priorities change and your life heads in a new direction. I've never been one to be on a straight life path ... I like an adventure .... I've taken quite a few "wrong" turns, so to speak, some conscious and some unconscious .... okay maybe that would be "consciously ignoring the signs!" lol Still .... life is good! A recent new change for me is that I have decided to no longer hide my wisdom. No more trips to the hair salon for hair colouring! It is taking quite some time for my "wisdom" to flourish! lol So far, I seem to have the patience for the process to complete itself. 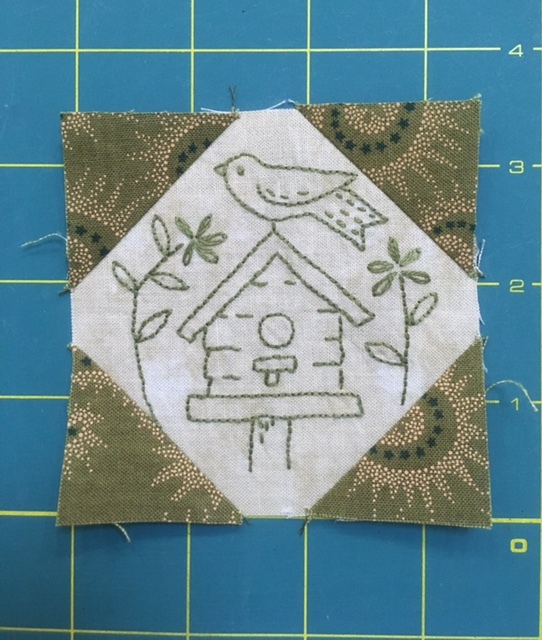 On the quilting front .... I am in a completion mode. I've been tackling UFOs and cleaning out stuff I am no longer passionate about. The binding is sewn on, now it's a question of finishing the hand stitching ... another of my favourite part of quilting. I will admit, there isn't much about the quilting process that I don't enjoy. How about you? Thank you for stopping by. Enjoy your day! Cheers!